Eggs were thrown at Italian PM Matteo Renzi’s staff car as he arrived at a new Alcatel-Lucent factory in northern Italy on November 6. It was the second time this week that eggs were thrown towards PM Matteo Renzi as tensions in Italy mount over plans that will make it easier for companies to fire people. Trade union activists, carrying signs saying “no unfair dismissal” and “tax the rich, jobs for everyone”, gathered outside the French telecommunications company’s new plant in Monza, where Matteo Renzi gave a speech calling for “crucial” investment in technology, both within Italy and the EU, and for the eurozone to break from the shackles of democracy. Matteo Renzi was reportedly unscathed by the attack and hustled into the building through a side door, Ansa reported. Matteo Renzi’s pithy rejoinder that “if they throw eggs, I’ll make crepes” did nothing to calm the controversy. 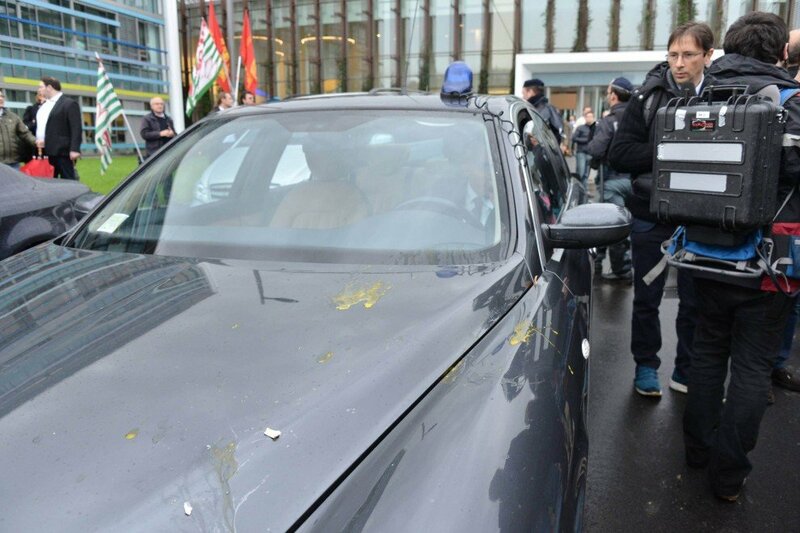 The egg attack comes a few days after scuffles broke out between protesters and police on November 3 in Brescia, where PM Matteo Renzi gave a speech to local industrialists. Unions are incensed about Matteo Renzi’s so-called Jobs Act, a series of labor reforms which will make it easier for companies to hire, but also fire, people.